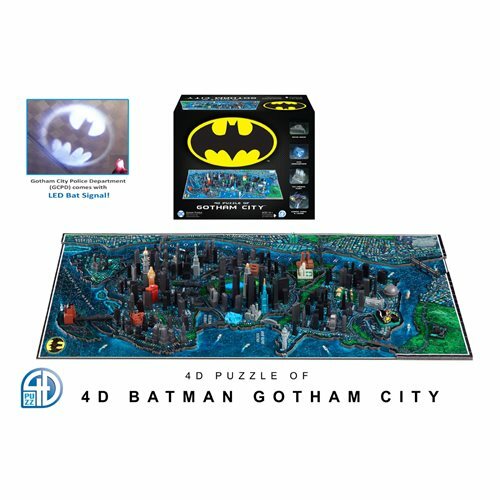 Based on DC Comic's famous Batman Comic Series comes this amazing Batman Gotham City 4D Cityscape Puzzle! This puzzle will guide players through the assembly of the official DC map of Gotham City in a patented multi-layer design. The first layer is a 1000+ piece jigsaw puzzle that will teach you all about the various locations and regions of Gotham City. The second layer is an artistic 200+ pieces jigsaw puzzle that replicates the night landscape based on DC Comics official map of Gotham City. The third layer you add 3D miniature replicas models into the puzzle, which include famous buildings and structures such as Wayne Manor, GCPD Gotham City Police Department, Ace Chemical Plant, Wayne Tower, Iceberg Casino & Lounge, and many more! Each model is a highly detailed sculpt piece of the actual location. In addition, the puzzle comes with an Official Guide to Gotham City that teaches you everything you need to know about Gotham City. Bonus items includes a mini LED Bat Light located at the top of the GCPD building. It shines the batman logo into the sky as Gotham City calls for help. When assembled measures about 32-inches wide x 19 1/5-inches long x 6-inches tall. Ages 14 and up. Requires 3x "AG3" batteries, not included.